hablar de la talla y el peso de tu hijo. Everyone wants their children to grow “normally.” But your pediatrician may or may not use the term normal. You might hear “average” or “expected.” As in “what’s average” for your child at a certain age. Regardless, the doctor is referring to how your child’s growth compares to the expected healthy growth pattern exhibited by millions of children considered healthy and growing as they should. Growth charts indicate average growth patterns for height and weight. 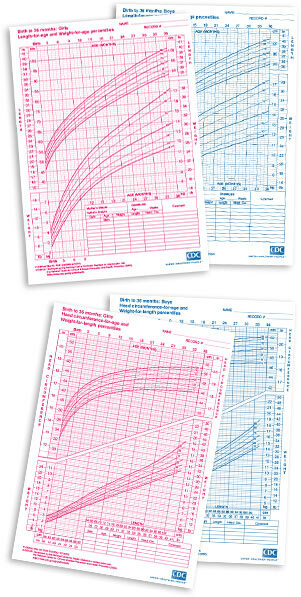 There are different charts for boys and girls, as well as charts for different age groups. And there are separate growth charts for children who have medical conditions or may be living in circumstances that might affect their growth. 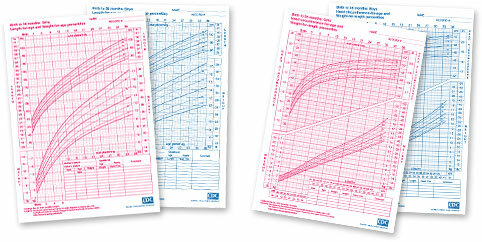 The growth chart displays curved lines that represent the expected pattern of gains in weight and height (or length) for children growing as expected. Each curved line (see illustration 1) represents what is known as a percentile. Percentile curves are indicated at 5%, 10%, 25%, 50%, 75%, 90%, and 95%. Your pediatrician is likely to talk to you about the percentile of your child’s height and weight at each regular check-up. The curved percentile lines on these growth charts show how children grow by gender in height, weight, BMI and more. What does percentile mean? For example, if your doctor says your child’s weight is in the 50th percentile, that means that out of 100 normal healthy children, 50 children would weigh more than your child, and 50 would weigh less. A child in the 70th percentile on height would be taller than 70 healthy kids and shorter than 30 of them. Just because a child is in a lower percentile does not mean there’s a problem. The parents might be below average in stature, so their child might be also. Your doctor will be able to determine if the percentile for your child is any cause for concern. There’s no specific answer for this question. You and your doctor are the ones who know enough about your child to determine if there is cause for concern over height and weight. In general, the medical community does not consider it worrisome unless a child drops or increases by a significant amount in percentile1. For example, any drop in weight between check-ups may prompt the doctor to discuss if there is an eating problem. 1. http://www.nlm.nih.gov/medlineplus/ency/article/001910.htm. Visitado el 7 agosto de 2015.